It had been a successful week in the kitchen. Lamb meatballs, loaded with mint and parsley, broiled and sprinkled with vinegar, tasted as yummy as ever; olive bread, a two-day labor of love, proved as it always does, a worthwhile effort; and tiropitas (cheese-stuffed fillo triangles), irresistibly delicious, burned my tongue far too many times. My Easter menu was all but finalized. I was feeling really good. And then I called my mother. “Mmm hmm,” my mother responded. I did not know this. Did you? I protested. I insisted there could be no possible way a few roasted cabbage wedges could overpower the smells of olive bread baking and of layers of fillo crisping and of lamb meatballs broiling. I affirmed, cabbage it would be. “Sounds wonderful,” she replied. We said our goodbyes. Of course I crossed cabbage off my grocery list upon hanging up the phone. Even if my suspicions are correct — that if the smells of bread and pita and lamb do in fact mask the cabbage — how could I possibly make it? Why add another worry to the list? Why tempt my guests to whisper on their ways home, “Great party, but boy, what was she simmering on that stove? Cat food?” I couldn’t take the risk. A Greek salad it would be. Oh, mothers. Mother! I love you. * If you can’t find ground lamb, buy a piece of lamb (shoulder is nice) and grind it yourself or have the butcher grind it for you at the market. ** I always use white sandwich bread (not Wonderbread) but you probably could use a bakery-style loaf of white bread, too. 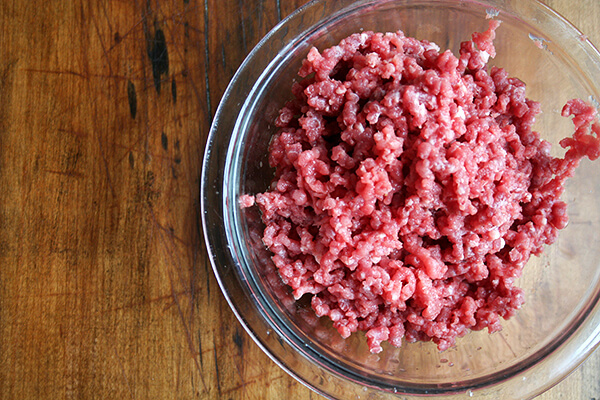 Put the ground lamb in a large bowl and spread out to create a thin layer. Season all over with the salt and pepper to taste. Sprinkle the onion over the meat. Top with the herbs and the olive oil. Meanwhile, toast the bread so it’s just dried out — not browned. (If you plan ahead, you can leave a few slices of bread out for a few hours. 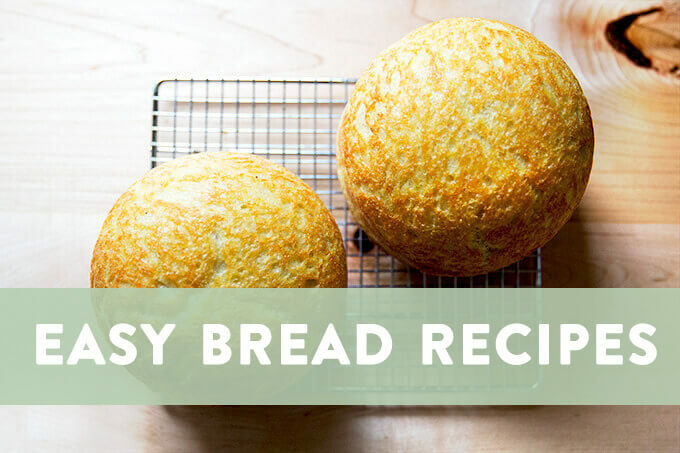 You also could dry out the bread in a 300ºF oven for 10 to 15 minutes.) Crumble bread slices into a separate bowl. Moisten with the wine, then add to the meat bowl. Add the egg to the meat bowl and then gently mix all of the ingredients together being careful not to over mix.OK, it’s time to test your mixture. Preheat the broiler. Using a tablespoon (a measuring tablespoon), scoop out a level spoonful and roll it into a ball with your hands. If it holds together, you’re good to go. If it doesn’t hold together, toast another slice of bread, crumble it up, soak it in a tablespoon more of wine, and add it to the mixture. When the consistency is such that a ball holds together, place it on a sheetpan. Season with a pinch more salt, pepper and oregano. Broil 4 minutes. Remove from oven, let cool, then taste it. Adjust meat mixture accordingly with more salt, pepper, oregano, onion or herbs. Broil another one, taste it, etc. — repeat process until you’re happy with the flavors. Chill your meatball mixture for at least an hour. This mixture can be made up to a day in advance, too. This might be a Greek tradition, but we sprinkle the just-broiled meatballs with a little bit of vinegar. Try it. You might like it, too. Preheat oven to 400ºF. 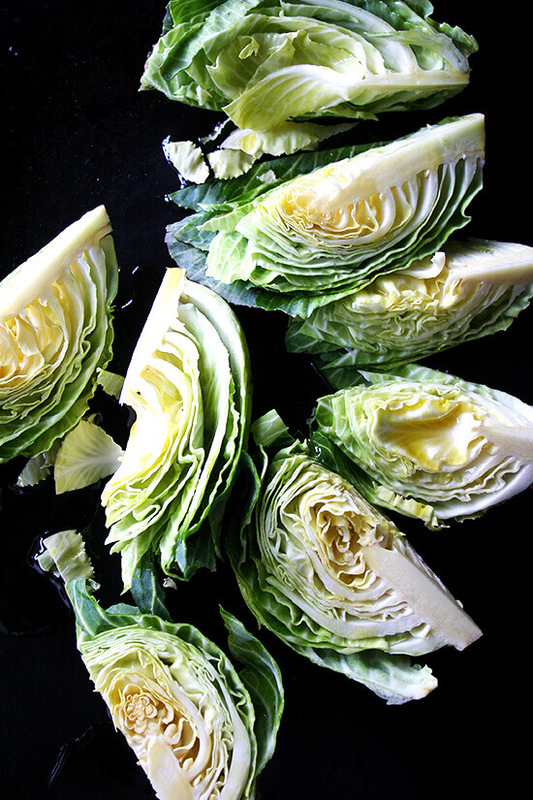 Toss cabbage wedges with olive oil and kosher salt on a sheetpan. Roast for 20 to 30 minutes. Test with a knife — they should be tender. Yum! These perfect for Easter…or any spring meal for that matter. Have you shared your tiropita recipe anywhere? BrookeO — I haven’t yet…that’s next week’s post! If you need the recipe beforehand let me know, and I’ll email it to you. I love your blog. The photos are beautiful and the recipes that I have tried so far have been great. I can’t wait to try your lamb meatballs, I think that our usual Easter menu could use some tweaking and I think this is the perfect recipe. You are really funny. Go for the cabbage! 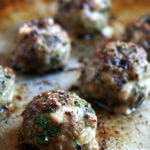 I’m trying these meatballs tonight. 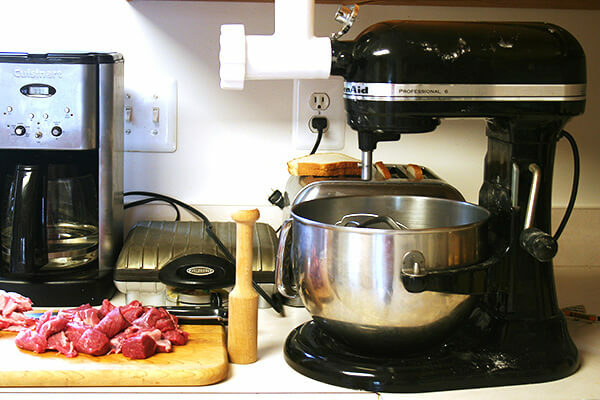 Can you help with a question: When I grind meat, I take off all the fat, but I think the fat adds flavor. Should I leave in a little fat? Oh and as always, your photographs–truly beautiful. Liz — I definitely think a little fat adds flavor. If you have a good grinder, definitely leave a fair amount on. In my grinder (it’s the Kitchen Aid attachment) the fat kind of clogs it up, so I have to be careful to not leave too much fat on, or to cut it into smaller pieces, which is kind of a pain but worth the effort. “Mmm hmm,” means the same from my mother. Funny how families whit strong food culture have the same idiosyncrasies. Lara and Aubs miss you and the little ones! Keep up the great posts! 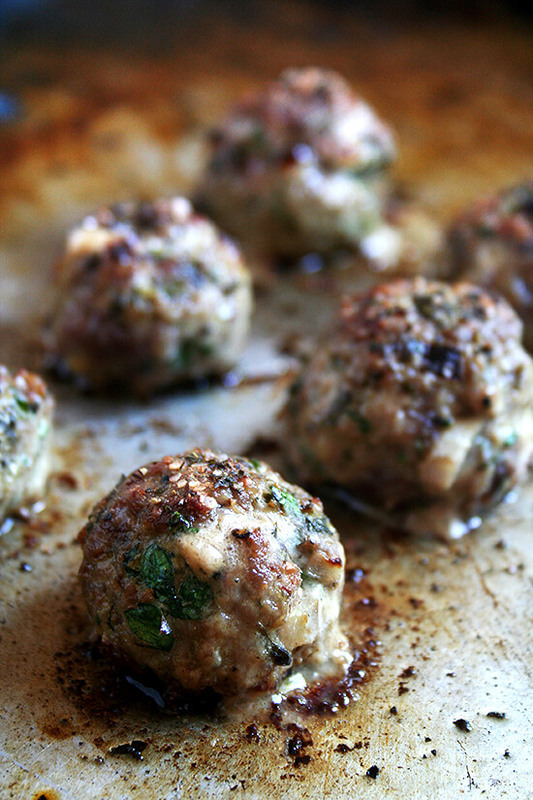 I’ll make these meatballs this Sunday as a trial run for Easter! Cheers from not so sunny San Clemente! Joe! So nice to hear from you. I miss you and Lara and Aubrey so much. Seriously, I think about our picnics in Pines Park often. So funny about your mother. My mother learned it from her mother who learned it from her mother. I’m sure I’ll do the same. Send my love to your family. I miss San Clemente even when it’s not so sunny. Ha ha ha! I had to laugh at the phone call with your mother as it ounds all too familiar :). Love the sound of these meatballs! Goodness I absolutely love that onion, mint and parsley picture. 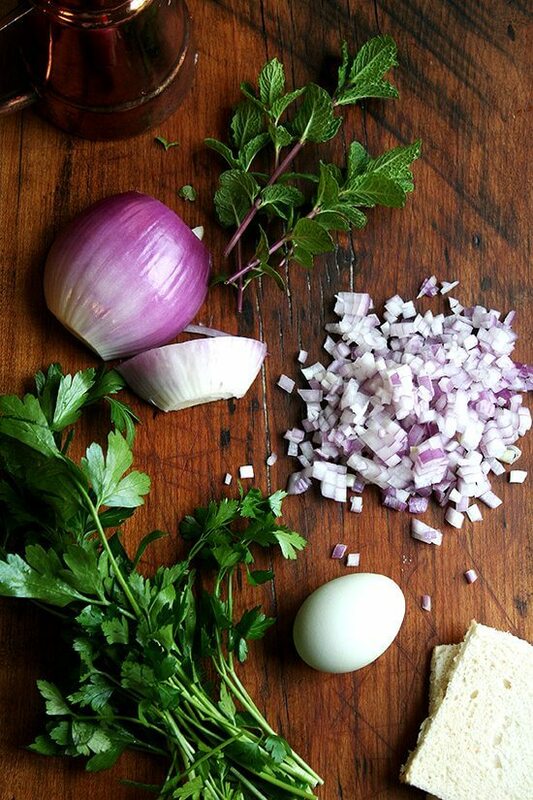 Mise en place are some of my favorite food pictures lately. 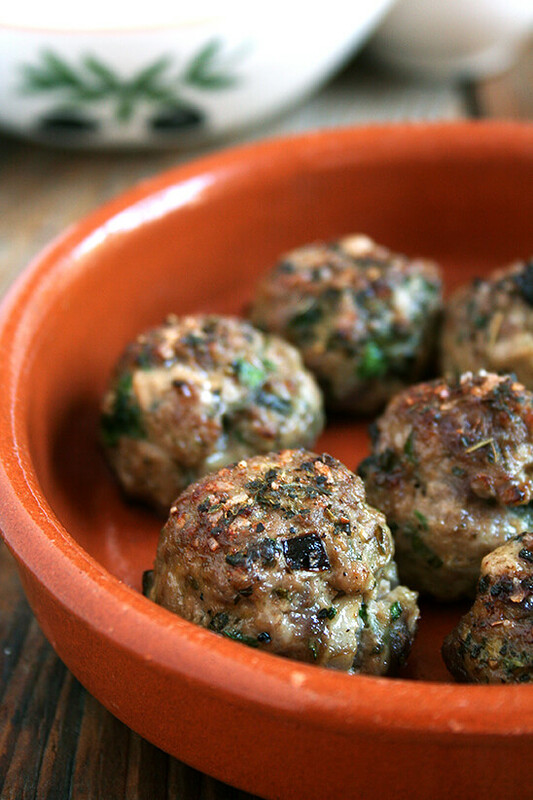 I love all kinds of meatballs, but these are the BEST! Thank you. I love the oregano. There’s a Greek market where I live that sells beautiful Greek oregano that comes in long sprigs. It’s lovely! As were the meatballs, and especially with all that talk about pink slime on beef, it’s nice to have an alternative. And btw, Australian and New Zealand lamb is all free range.I know you are very concerned about how humanely animals are raised. Gorgeous photos, fun (and funny:) narrative, and great recipes! 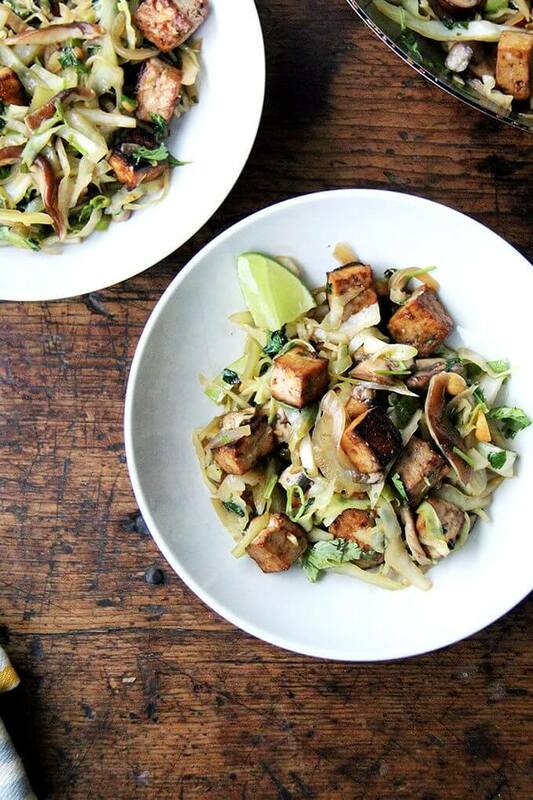 I just made the roasted cabbage tonight and it was fantastic- and fantastically easy! Love it! Lamb meatballs up next weekend I hope! Thanks Ali! Jennifer! So fun to see you here! So glad the cabbage turned out well. Now, I’m probably talking non-sense here but do you think I can replace lamb with beef? My boyfriend doesn’t like lamb but I really want make this…badly! That first shot you have there, it’s nuts! Instant: omg I’m salivating. 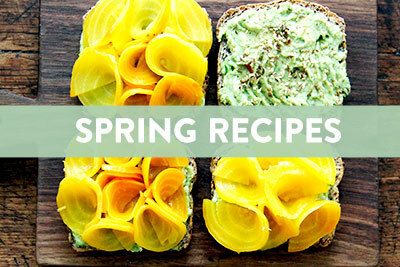 It looks *beautiful* I’m making these this weekend. 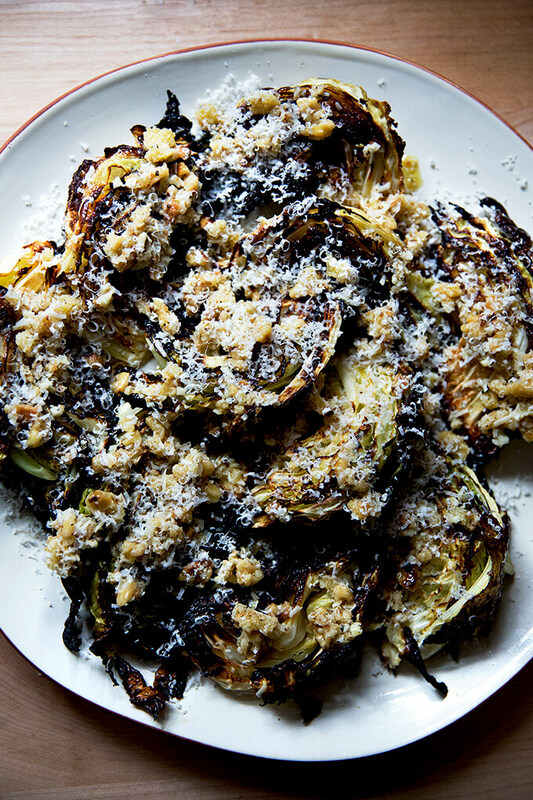 I LOVE roasted cabbage (and cauliflower, which has the same vibe). 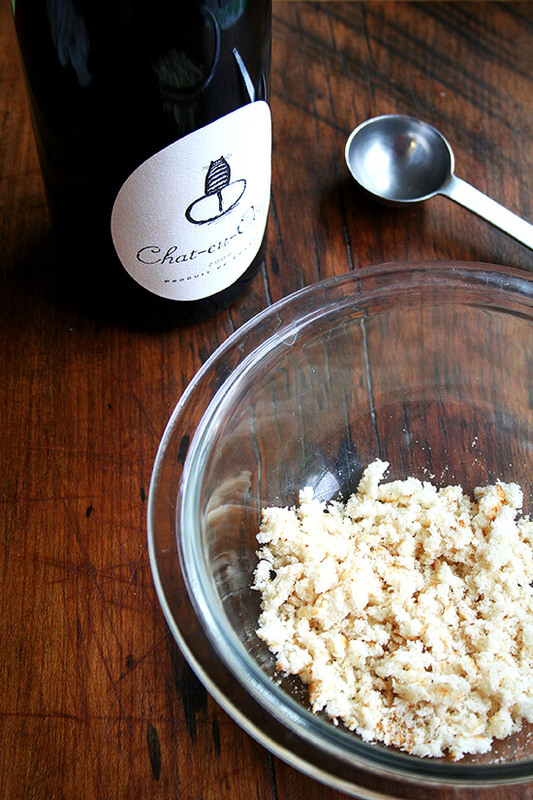 I’m also dying to try this vinegar sprinkle trick…sounds like a perfect final flourish. Ali I want to print out and frame that cabbage shot. So pretty. And also cook it. I am not even remotely greek, but we will be enjoying these this weekend! Another amazing post!! sK — so happy to hear this! To be honest, I’m never quite sure I’ve done the bread correctly 🙂 I always call my mom about this step. It seems odd to moisten bread with wine to then use it as a binder, but according to my mother, it’s very traditional to do so. I think lamb and turkey sounds wonderful! you know what, I just had my leftovers for dinner, and my veggie was roasted cabbage. I LOVE IT, and we eat tons of it at our house. 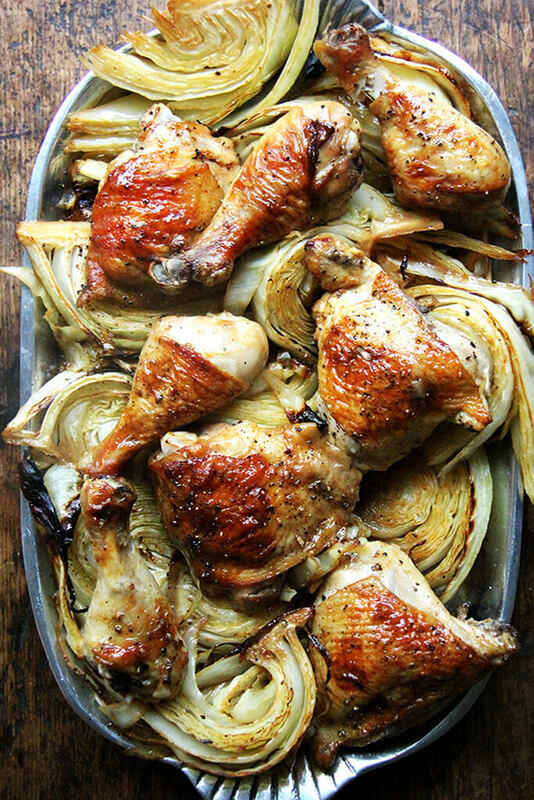 I love putting it in the pan cut in wedges like you and sometimes I even add other veggies in, like carrots and wedged onions, sometimes even a few sweet potatoes. but that cabbage is always what everyone wants!!! Hi, Alexandra. 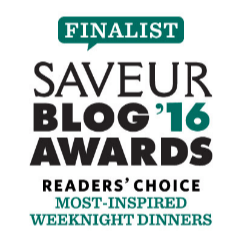 Thank you for satisfying so many of my senses with your blog. My co-worker spied me ‘pinning’ this onto my boards, and she asked me to hint at her that wanted these for my early birthday work celebration. She’s a novice, and these turned out perfectly. I couldn’t have asked for more. 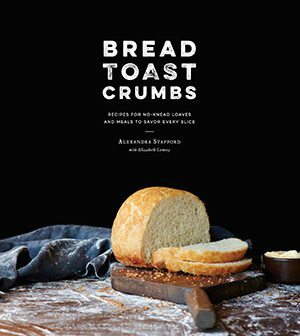 I do have one question– Have you ever measured out the bread slices after you have turned them into bread crumbs? Might 1 slice equal 1/3 to 1/2 cup or something? Thanks, again. (just so you know, my c-worker used panko in hers– like I wrote earlier, she’s a novice, and the whole thing might have been too scary for a first attempt). Isela — You’ve got it — I have a note that the two slices of bread crumbs equals about a cup. Thanks for the tip on Panko, too — I love that stuff. What a nice co-worker you have! So happy to hear that the meatballs were a success. We love them, too. Thanks for writing in! Your photos are amazing. Thank you for the great recipes! We love these – tried for the 2nd time tonight – first batch was dry to me so this time I added a cup of broth to the pan to keep moist. I think Williams Sonoma sells a lamb broth but I used the beef consumme I had already – tried these bc we love your roasted cabbage and funny story about your mom – perfect with tzatziki too! Jen — so happy to hear this. Glad you improvised with a cup of broth. I bet that added some nice flavor, too. Glad you thought the cabbage story was funny, too. I love these meatballs with tzatziki, too, and they are delicious served with some sort if pita bread — I love that Naan bread you can find at most grocery stores these days. So good! i’m not sure if your remember me because we only met a few times on the soccer field wayyyy back in the day. i’ve been reading your blog since i saw your mother a few weeks back and i wanted to let you know that i am liking it a lot (especially when you tell these little stories about your mom who i love). it’s really nice to get to know you a little bit better through your recipes and anecdotes. Alexine of course I remember you! And my mother had just told me about your recent get together and how wonderful it was, as always, to see you! I imagine cooking is quite challenging without the basic equipment…you could start a pretty fabulous blog about cooking with the bare minimum 🙂 I bet the circumstances have taught you to be creative. It would be lovely to meet you again! Thanks so much for writing. Just made with gluten free bread crumbs…. oh my! One of the best dishes I’ve ever made. Hubby and 7 yr old both gobbled them up. Thank you! Very tasty! 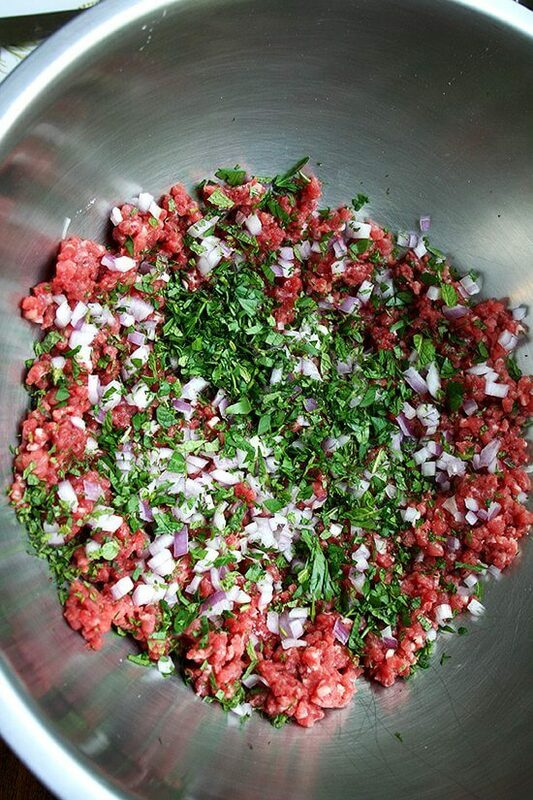 I’m not a lamb fan but your ingredients really mask the gamey flavor and make a delicious meatball! Thank you!!! wonderful to hear this, Amy! 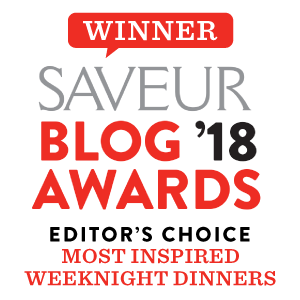 Congratulations onvyour book Ali,and when it comes to food blogging in my mind you are unbeatable,question if I don’t want to use the alcohol whatcan I use as a substitute? Thank you hafsah! You are too kind. You can use any liquid — milk, buttermilk, water. This is my second time I have made your recipe. Love Love Love it!!! Thank you so much for sharing!!!! So happy to hear this, Alice! Hi Marisa! So sorry for the delay here!! 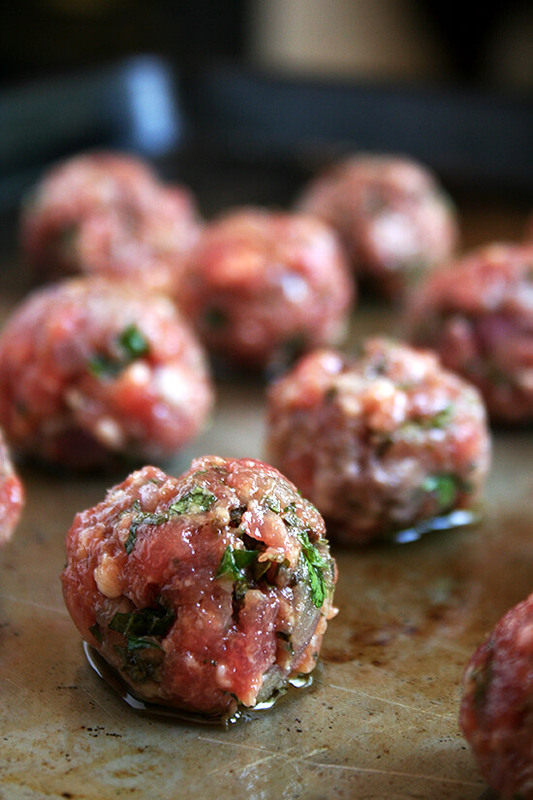 You can definitely make the meatballs ahead of time — I know people who make the balls ahead of time and freeze them. I have not done this, but I have made the mix a day in advance, then formed the balls the day of. You probably could shape the balls up to a day in advance, too, and keep them in an airtight container in the fridge. Hope your Easter meal was a success!